Peptide with sequence C-NAANVGWNNSTFA, from the C Terminus of the protein sequence according to NP_002406.1. Western Blot: Approx 13kDa band observed in Human Lymph Node, and Thymus lysates and similar bands are observed in lysates of cell lines Daudi and Jurkat (calculated MW of 12.5kDa according to NP_002406.1). Recommended concentration: 0.01-0.03ug/ml. 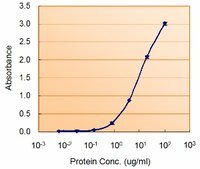 Enzyme immunoassay: Sandwich-type ELISA with increasing amount of recombinant MIF captured by a rabbit antibody. Recommended reporter concentration: 1.5-3ug/ml. (0. 01ug/ml) staining of Human Thymus lysate (35ug protein in RIPA buffer). Primary incubation was 1 hour. Detected by chemiluminescence. (0. 01ug/ml) staining of Daudi (A) and Jurkat (B) lysate (35ug protein in RIPA buffer). Primary incubation was 1 hour. Detected by chemiluminescence. (1.5ug/ml) as the reporter with as the capture rabbit antibody (5ug/ml). MIF: a lymphokine involved in cell-mediated immunity, immunoregulation, and inflammation. It plays a role in the regulation of macrophage function in host defense through the suppression of anti-inflammatory effects of glucocorticoids. This lymphokine and the JAB1 protein form a complex in the cytosol near the peripheral plasma membrane, which may indicate an additional role in integrin signaling pathways. Also acts as a phenylpyruvate tautomerase.